I’ve been thinking about chili for a while. I make a decent chili. But I wanted a GREAT chili. I wanted something incredibly flavorful. And I wanted some chipotle peppers in my chili. 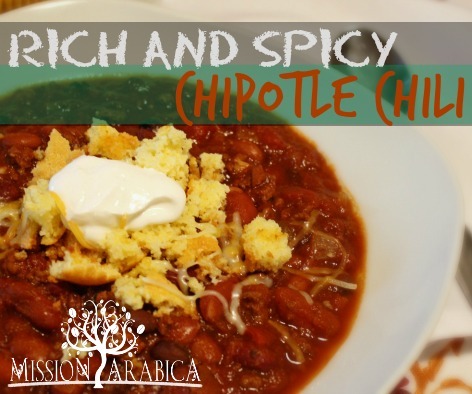 I love the flavor of chipotle peppers, but sometimes the heat can be over powering. So I needed something to mellow the heat and add richness. I told my husband I was going to add a few secret ingredients, and when I told him the secret was coffee and cocoa he made a face at me like I’m a crazy woman. But I told him… it’s kind of like when you put vanilla in your chocolate chip cookie dough, you don’t bite into the cookie and think—oh yeah, there’s the vanilla—but it adds a depth of flavor to the over-all cookie experience. 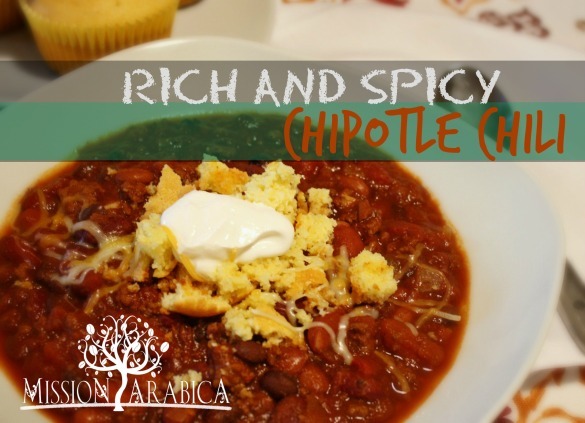 Similarly… this chili doesn’t taste like coffee or chocolate, however I think they add a mellow richness that seems to temper the heat of the chipotle peppers and enhance the flavor. But this is a lot of talk and not enough chili in your mouth. So get to it. And tell me if you do not agree; this is GREAT chili. *I like a mixture of beans in my chili, if this freaks you out, you can go all chili beans, or all kidney, or whatever your preference is. **The people around me are picky about chunks of tomatoes, so I usually use only one can petite dice tomatoes, if you prefer a chunkier chili, you can swap a can of diced for a can of crushed, or vice versa. Open the can of chipotle peppers, and grab 2-3. (You can use more if you like it super spicy, if you are not used to chipotle peppers, I recommend starting with 2, you can add more later if you want more heat.) Finely chop the peppers and add to the pot with the beef (seeds and all). Drain and rinse your beans (none of that slimy can-juice nonsense, please) and add those to the pot along with all the tomatoes. Add coffee and stir. Thin with water, if desired. Bring to a boil. Once it bubbles, turn it back to a simmer, stirring only occasionally to prevent sticking. Simmer for an hour or more. Serve with corn muffins crumbled on top and a cool creamy dollop of sour cream. YUM! 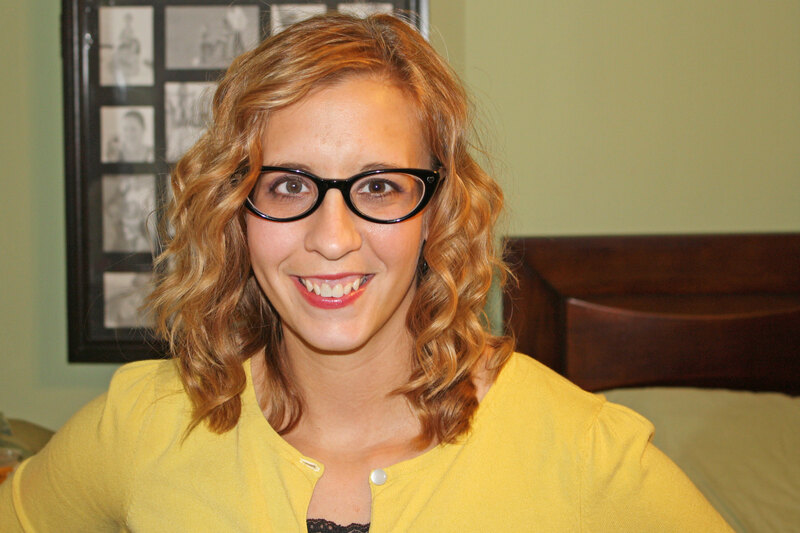 Valerie is a midwestern girl with a passion for good food and hospitality. The diverse palates and dietary needs of her family put her creativity to work in the kitchen and keep her table full. She is a full-time mom to two dangerously handsome boys and married to her best friend, Zachary. When she finds a moment to herself she also enjoys sewing, singing, and authoring a creative blog.